Lightning never strikes in the same place twice. When Tennessee is ranked No. 1 in basketball, however, it hits really, really close. For the first time since 2008, the Tennessee Volunteers (17-1, 6-0 SEC) are the top-ranked basketball program in the country. Unlike 2008, however, the Vols remain atop the polls after Wednesday night’s slugfest against unranked Vanderbilt. Tennessee’s victory against the Commodores (9-9, 0-6 SEC) was won in large part to a career-high 43 points from junior forward Grant Williams, who paved the way for an 88-83 overtime victory. With its sixth conference win of the season, Tennessee extended its win streak to 13 games. The 17-1 start for the Vols is the best in program history. As the No. 1 team in the country, the Vols are likely to get every opponents’ best game. The past two contests have yet to prove otherwise. After surviving a 71-68 nail-biter at home against Alabama, the Vanderbilt Commodores had the Vols against the ropes in Nashville’s Memorial Gymnasium. 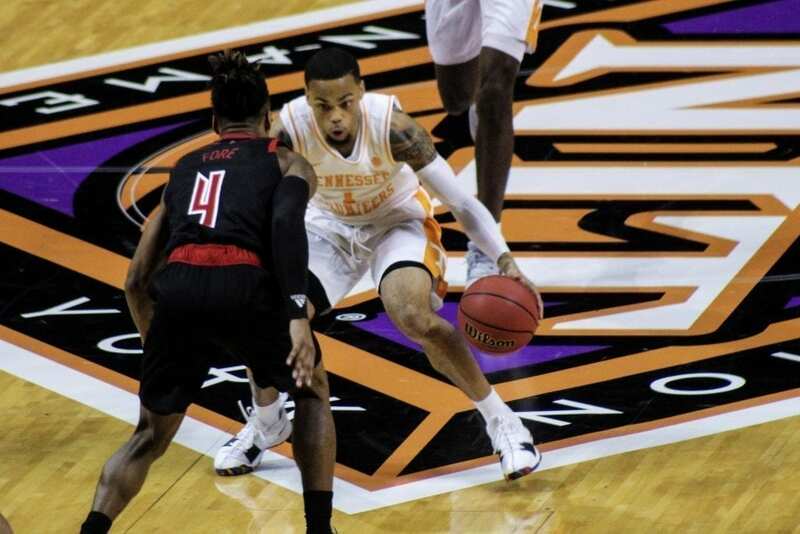 “We weren’t perfect by any stretch of the imagination, but we found a way to win,” Tennessee basketball coach Rick Barnes said. The testament of elite teams is the ability to win in the face of adversity. Despite having a lot more “Peanut Butter” than “Jelly,” Tennessee proved its status among the elites. The SEC’s two leading scorers are Grant Williams, with 18.9 points per game, and Admiral Schofield, who averages 17.4 points per game. Against Vanderbilt, Williams more than doubled his average with a 43-point explosion in which he went a perfect 23-23 from the free-throw line. Schofield, on the other hand, only added six points. Tennessee only saw double-digit scoring from two players: Williams and Jordan Bone, who added 12 points, 7 assists and zero turnovers. Perhaps no points were more important, however, than the two points scored from Jordan Bowden off of an inbounds alley-oop from Jordan Bone. The thunderous dunk from the Tennessee guard sent a spark to the offense, but it also sent a message. Vanderbilt head coach Bryce Drew expressed his pleasure with his team, as well as his displeasure with the officiating: “We thought we deserved this game; we thought there were things out of our control that prevented us from winning this game.” A controversial flagrant foul on Clevon Brown with 1:22 to go in regulation while Vanderbilt led 76-70 gave Tennessee two foul shots, possession of the basketball and momentum late in the game. The momentum would carry for the Vols, who forced Vanderbilt to a score of 76-76 to end regulation. In overtime, the Vols held Vanderbilt to 2-8 shooting and just seven points. Up next, Tennessee will face West Virginia on Saturday in Thompson-Boling Arena. The game will tip off at 4 p.m. ET and can be seen on ESPN or ESPN2. Featured image courtesy of Jake Nichols.